Five hundred ml of soy beans were turned into tempeh. Procedure is wash, boil for 15 minutes, remove hulls and split by rubbing about five times and draining off. Pressure cook about 45 minutes, remove and cool to room temperature 20C, add tempeh starter and mix well. Place in cotton lined molds. Place in fermenter for about 36 hours. Wrap in plastic wrap and store in refrigerator. The cooler refrigerator effectively stops further fermentation. 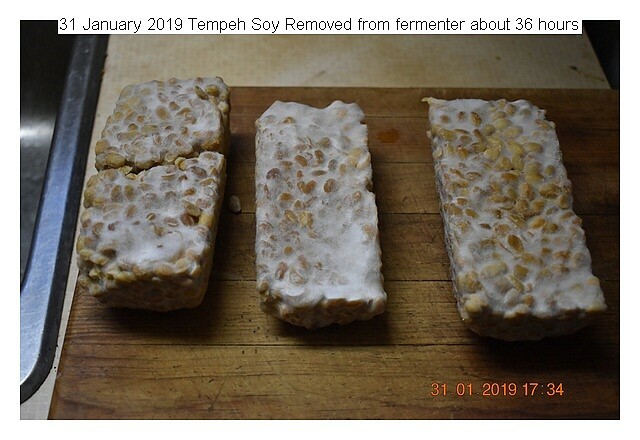 This entry was posted in Uncategorized and tagged 31 January 2019 Tempeh Soy, Tempeh Soy. Bookmark the permalink.